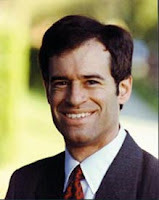 Recently, activist and entrepreneur Ron Unz used results from a short English vocabulary test, called Wordsum, to argue that Mexican Americans have risen in intelligence, shrinking their intellectual disadvantage relative to white Americans by two-thirds. 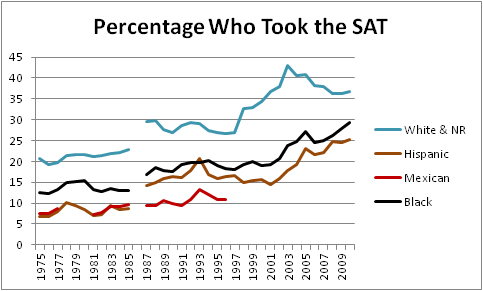 David Sanders (an alias) countered this claim, using one of my previous posts on racial group differences in SAT performance. 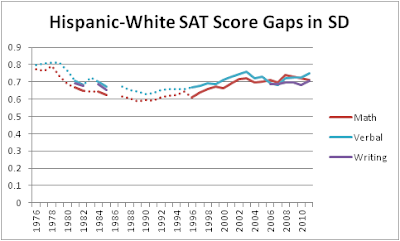 Although several different arguments were made, the strongest and most detailed focused on an examination of the ethnic distribution of American SAT scores between 1980 and 2010 [sic], performed by another highly quantitive racialist blogger. 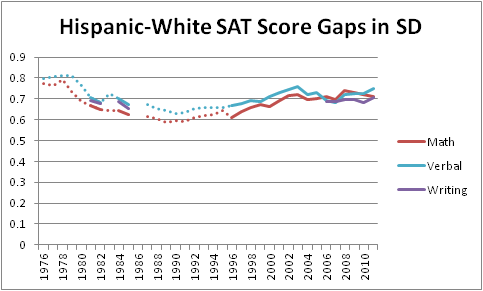 The article pointed out that there was virtually no net change in the substantial Hispanic/white performance gap on the SAT during those four decades. Since the SAT is a far better proxy for IQ than my Wordsum values, and the number of participants across those years number in the millions, any possibility of a large rise in Hispanic IQ would seem completely disproven. My claims had focused on American-born Mexican-Americans rather than Hispanics in general, but since the former group represented a large and rapidly growing portion of the latter, my argument would seem to have suffered a very serious blow. However, this is incorrect…. With some effort, I managed to obtain the ethnic distribution of SAT test-takers back to 1975 and then compared these results with the ethnic distribution of 18-year-olds during those years, found in the Census-CPS [Current Population Survey] data. Just as I had suspected, the changes were dramatic. 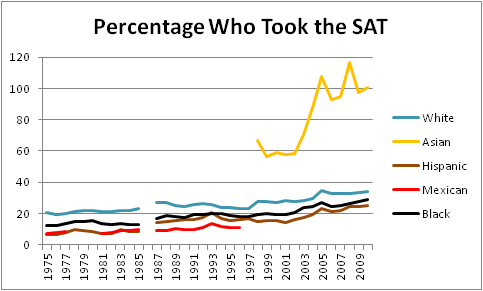 In 1975, 22% of whites took the SAT, and this had risen to 33% by 2011, a substantial rise of 50%. However, during these same decades, the percentage of Hispanic test-takers had grown from 6% to 32%, an enormous rise of over 400%. Thus, in 1975 white 18-year-olds were nearly four times more likely to take the SAT, but by 2011 the ratios were almost exactly the same…. 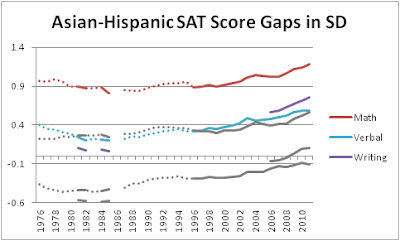 Since the white/Hispanic gap remained unchanged during this tremendous broadening of the Hispanic testing pool rather than greatly widening, the only possible explanation would seem to be a huge rise in average Hispanic academic performance, just as was reflected in the Wordsum-IQ scores…. 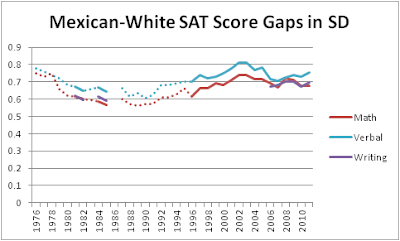 Thus, upon closer examination the SAT evidence cited for the alleged lack of Hispanic gains actually becomes very powerful evidence for strong Hispanic gains. After going through reports from CPS, I have been unable to replicate these numbers precisely. Most of the reports that I found give combined totals of 18- and 19-year-olds, so I divided those in half, which I consider a fair estimation. I also cannot locate a report for 2011. Assuming CPS has released it somewhere, the notion that the participation gap dropped from nine percentage points to one in a single year defies credulity. For white students, my results are similar to those of Unz. Their participation rose from 21% to 34%, an increase of 61%. If one looks at the full range, rather than just the bookend years, the rise is 19% to 34%, 79% higher. I found that Hispanics rose from 7% to 25%, which is a 257% increase. That is still a huge jump, even if it is not 433%. The rates of change of participation in the graph look similar, but Hispanic students start much lower. However, discussion of the exact calculations is moot because both sets are based on a falsehood. Take a close look at the graph. Notice anything strange? 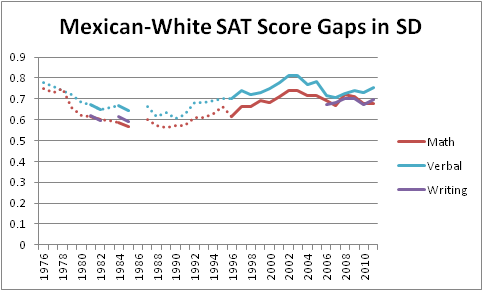 In 1987, non-Mexican Hispanic students suddenly resolved to take the SAT in much greater numbers. Before one goes searching for a mind-blowing ‘80s Spanish public service announcement, I must reveal (again) that the College Board added a third category of Hispanic in 1987, in addition to Mexican and Puerto Rican, and this new category was “other Hispanic.” A group of people who had previously been something other than Hispanic consequently metamorphosed into Hispanic people with sombreros, I think. Other Hispanic students (or, as I prefer, “Hispanica Miscellanea”) rival Mexican-American students in number. The dramatic quality of the rise in Hispanic participation merely represents an artifact of definitional change. Calculations with a starting year of 1987 give a white student range of 23% to 34% (a 48% increase), an African-American student range of 12% to 29% (a 71% increase), and a Hispanic student range of 14% to 25% (a 79% increase). Unz was making the point that SAT data support a secular rise in Hispanic cognitive ability, according to the fundamental law of participation level-actual ability direct correlation. This law allows us to assume that Hispanics are becoming smarter if they can take the test in greater numbers while only slightly worsening their score performance relative to white students. My only problem with the law is that the SAT dataset is riddled with countervailing examples, as I previously discussed. One counterexample is particularly illustrative. In 1998, CPS discovered the existence of a group of people called the Asian Americans. This extraordinary new tribe possesses a pleasing aesthetic, but they can only eat with primitive sticks. After a detailed analysis of Asian SAT performance and participation, I can confidently state the broad conclusion that Asians are different. As the above graph proves, Asian Americans so enthusiastically partake in the SAT that they achieve participation proportions greater than all of them. It seems that some proportion of Asian SAT takers are foreign students unrecognized by the US Census. I wonder if the Hispanic-American community also includes a group of census-undercounted individuals who nonetheless live here. 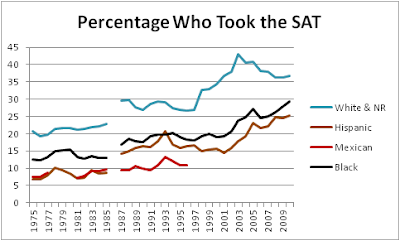 Asian students are the one racial group whose SAT performance is taking off, and they have achieved this while increasing their test participation 105%, and I already dispelled attempts to use foreign-student involvement to explain away Asian score advancement. For emphasis, I shall present this graph of the Asian-Hispanic score gap in standard deviations, superimposed over the Asian-white score gap, with the colors of the latter set to grey. In fairness, my essay raised the possibility to white aptitude decline relative to other groups and included in the reasoning a possible decline of white participation. If those who do not identify their race are largely white, as I hypothesized, then white students have decreased their participation from 43% in 2003 to 37% in 2010. However, that would also mean that white students had increased their participation since 1987 by 87%, at their peak, which is a greater increase than that of Hispanics, and the possible rise and fall left no footprint in the graph of the Hispanic-white gap. 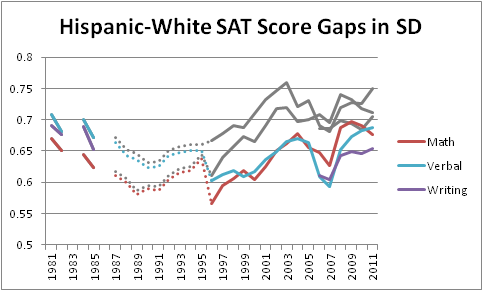 Despite the racial disquiet that the SAT invokes, the test might actually be hiding the full extent of the racial gaps. First of all, the College Board altered its scoring algorithm in 1996 with the explicit purpose of narrowing racial gaps. Second, unlike the score range of many IQ tests, the SAT score range is, itself, sufficiently narrow so as to construct a secure floor for the bell curve’s far left and a ceiling that holds down the absolute best. I have perhaps overemphasized in the past the fact that African-American students have a larger gap with white students on the SAT mathematics subtest than on the writing and reading subtests. I cannot rule out that the subtest differences result purely from the massive number of African Americans who occupy the floor of the reading and writing subtests, as I previously graphed. Likewise, I can now reveal additional years of the white and Asian mathematics subtest bell curves that demonstrate substantial increases in perfection or near perfection of what was already outstanding Asian mathematics success. Therein lies the crux of the issue. If all Unz wanted to prove was that the “Strong IQ Hypothesis” fails to account for the malleability of cognitive results, he could have cited the Asian advancement on the SAT. By bothering to analyze SAT results over time and by describing the progress of Asians, I have already implicitly acknowledged that some things do change and environment matters, at least under some circumstances. Usually, efforts to deny the existence of, minimize the importance of, or supply loose elasticity to IQ share the same impetus as the linguistic pursuit of calling “race” a “social construct.” The canards aspire to overrule by abstraction or technicality evidence for sociological generalizations labelled “stereotypes” or to beg the question regarding biological causality without dirtying one's hands with biological evidence. Recognizing an Asian academic model only reinforces a stereotype, to which even many Asians strain to take offense. 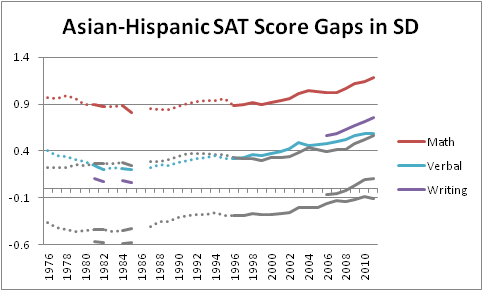 That the SAT does not yet demonstrate an unmet potential in Hispanic Americans provides no paradox of proven unmet potential. To even engage the issue is to take for granted a stereotype. All good people are asleep and dreaming. Those are some reasonable points, but I doubt your Asian/Hispanic analogy hopes. Bear in mind that there are a vast number of foreign Asian students attending U.S. universities, hence taking the SAT. I doubt the relative proportion of foreign Hispanic students (from e.g. Latin America) is even remotely in the same league, hence doesn't similarly distort the Hispanic figures. The data which Razib Khan provided for me included the SAT ethnic numbers for various years, as well as the Census-CPS numbers of ethich 18-year-olds, with this latter figure fluctuating considerably, presumably due to the small sample sizes involved each year. 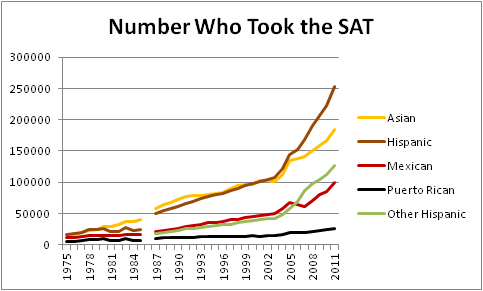 Furthermore, official ETS documents do report a remarkable rise in Hispanic SAT test-takers between 2010 and 2011, which has also been discussed in the newspapers. The figures I have for 2011 were 790,000 Hispanic 18-year-olds and 253,000 Hispanic SAT takers, for a 32% participation rate, almost identical to the white rate. So I think my rough estimates stand. You speculate that the No Response category probably represents additional whites, and this would substantially raise the white SAT participation rate over the last couple of decades. This may or may not be partially correct, but since the NR scores have often been dramatically lower than the white scores, as shown in your previous charts, this might also have significant effect on the white+NR average you are comparing with the Hispanic average. For example, note that in 2011 the NR verbal score you report is actually just below the Hispanic verbal score. If one assumes that all foreign citizens are Asian, then Asian-American participation rose 197% between 1998 and 2010, which is 3 times the Hispanic participation increase rate over the same period. If one only assumes that all foreign citizens who are not US residents are Asian and excludes them from the Asian totals, then Asian-American participation only rose 38%, which is just over half of that of Hispanics. However, that would assume that no undocumented Hispanic immigrants take the SAT and that all of them respond to census surveys. There were 1,768,000 Hispanic 18- and 19-year-olds in 2010. When I just estimated that half were 18, Hispanic population numbers steadily rose from 2005 to 2010. A drop of about 94,000 seems peculiar. In any case, “Hispanic” numbers in 1975 and 2011 constitute a false comparison. I was just wondering if you would consider doing these graphs for the ACT test? Both tests are equally accepted at all the colleges now. My son received a 36 on the first ACT test he took, so he never even took the SAT. I know he stated the majority of his male friends took the ACT test due to the fact it is more heavily math and science. I was just curious if more male White/Caucasians take the ACT test. Or if say more Whites male and female take the ACT test. 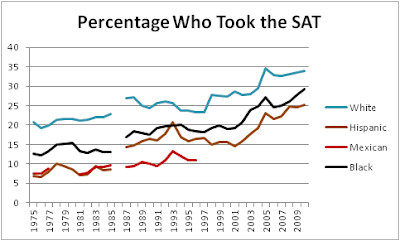 I bring this up because reading that just 33% of Whites take the SAT seemed very low. Thanks! Sure, I shall look into it. Chuck has another post up on this. To update this discussion, the CPS just released their 2011 report, which showed 1,743,000 Hispanic 18- and 19-year-olds, who attend school. That is roughly 871,500 Hispanic 18-year-olds, or a 29% SAT participation rate, not 790,000 or 32%. The white-Hispanic participation gap, not counting those who did not respond to the race question, fell to 6 percentage points, not 1.